Once your participants are done voting, they will receive a success page on their voting devices! 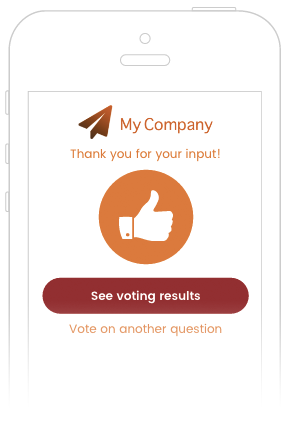 If you have used a customized theme and logo for your presentation (Pro feature), the following is how your voter's success page will look like. 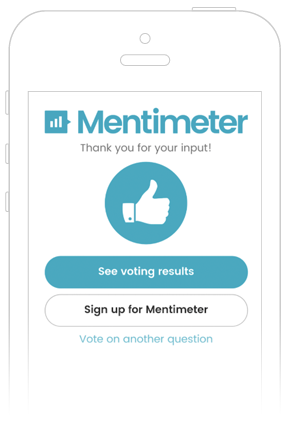 It shows your own logo, with the 'Sign up for Mentimeter' button removed. If you have selected the feature to allow audience to download results, your participants will be prompted to submit their email addresses at the end of the session. They will then receive an email for them to re-access the results at their own time. After the presentation, you can also choose to download the results for your own reference or to make further analysis, especially with the Excel file. If you wish to re-use your presentation for any subsequent sessions but want to store the results from all sessions, be sure to use the 'ask question again' function from the presentation view menu.